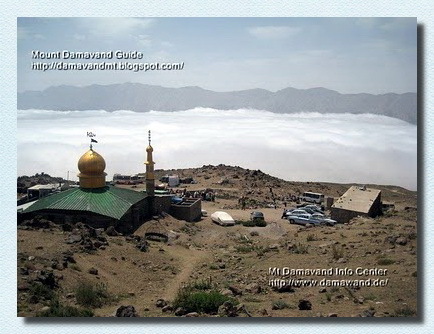 Q- Please tell us what is in Camp 2 base of Damavand ? A- There is a shelter and a mosque, and a sheepfold, see also Camp 2 Base. Q- I would like to ask if there is any Hut in Gosfandsara (Camp N.o2 Mt. Damavand)? A- No hut , there is just a shelter/refuge and a mosque which are not suitable for use. Q- I understand, you would not recommend to stay at camp 2. A- Yes we do not recommend to use Camp 2. Q- How is it about camp 2 / Gosfand Sara. Is it possible to sleep in the mosque there? I assume it is not accessible by cars in March and reaching camp 3 form Polour in the day might be tough. A- If you like you may use the camp2 base, beside the mosque, there is also a shelter. When the gravel road is not accessible by car due ice and snow, you should start from Gravel Road Junction (No 5 in GPS Landmarks), and instead of using camp2 you may add about two hour to your ascend to reach the Camp 3 Bargah Sevom New Hut. Q- In case we don't get the refuge reservation, it will be easy to find some person in Palour or Reineh who could hire us a tent and brig us to the Camp 2 by car? A- The mentioned limitation for reservation is mostly for Camp3 New Hut. Camp1 Polour is big and usually you can find some sort of place for your accommodation and find a car to Camp2 Base. See also Warning about Camp2 Base: The bad situation of base camp, it is the worst campsite in the area and it is not recommended for any use or acclimatization in summer because it is too crowded and too dirty. A- Damavand shelters and refuges are open all seasons. Q- Any costs for camping in Camp2 Base/Goosfandsara? A- Remember you should pay you climbing permit any way! Camp2 is free of charge, but we do not recommend camping in this place in summer. Q- Can I get to Camp2 Base (Mosque, Goosfand Sara), with my own car which is a L90?. I mean dos the last 6 Km of the road allow me? A- In summer yes, but not recommended because you may damage your car. Q- Is it possible to park our car at Camp 2 in a save place? Q- Can you organize us a save place for the car? Q- - It is possible to sleep at Camp 2 or nearby without problems in the camping car? (better for acclimatisation). A- Yes, but not recommended to be near the area. Visit also Camp2 Base and Warning 1. Q- We would like to stay one night in the shelters at Base camp in July. A- We do not recommend Camp 2 Base. See also Warning.